The VM Network step of the wizard is available if you have chosen to change the location and settings of the restored VMs. Select a VM in the list and click Networks. The Select Network window displays all networks that are configured for the destination vApp. 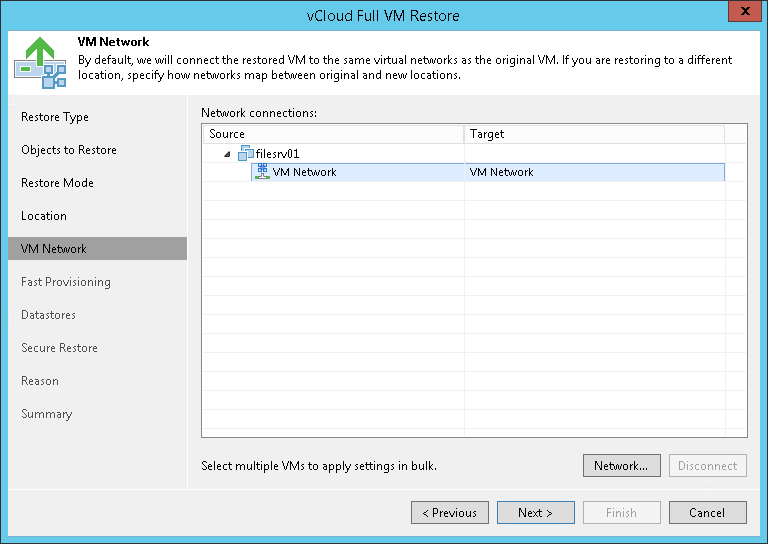 From the list of available networks, choose a network to which the restored VM must have access upon restore. To facilitate selection, use the search field at the bottom of the window: enter a network name or a part of it and click the Start search button on the right or press [ENTER]. To prevent the restored VM from accessing any network, select it in the list and click Disconnected.